To see his record as Governor, plus more on him Click Here ". Caesar Rodney rides through history as not only Delaware's Hero but a Hero of America and its war of Independence. He held more public offices than any other Delawarean before or since. He was a soldier, judge, a delegate to the American Continental Congress, speaker of Delaware's Assembly, President (Governor) of Delaware, a justice of the state's Supreme Court, and held many other local offices. No known portrait of Caesar Rodney exists. 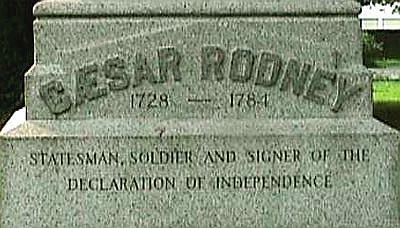 Caesar Rodney's lineage shows both English and Italian heritage. His grandfather, William Rodney, first came to America in the 1680's. During the 1690's William had settled in the Dover area. There he became the Speaker of the Assembly by the year 1704. William's son Caesar married Elizabeth Crawford, daughter of an Episcopalian minister Reverend Thomas Crawford. October 7 - Hung some tobacco. Came in, got dinner and killed some squirrels ... About eleven o'clock at night, my wife awakened me for she was very bad. I got up and sent for ye midwife and women. But before any came, ye child was born and it was a SON. There was no soul with her but myself, being I believe just about midnight. Dear Child, be diligent at your Books and make what progress you possibly can in learning while you have an opportunity. I hope you'll be careful in choosing your company. I would have you use all possible means to get in favour with the better sort of people, for there is not greater advantage to youth than good company. Nor so greater disadvantage than ill."
Caesar Rodney senior died in 1745 leaving his oldest son the duties of being the man of the farm when he was only 17 years old. Nicholas Ridgely of Dover was named Caesar's guardian. Mr. Ridgely was the clerk of the peace for the Kent County court and prothonotary which meant, of course, that he had knowledge of the law and books. Caesar was intrigued by this and apparently developed a longing for public life. In the year 1755, at the age of 27, he became the high sheriff of Kent County and served at that post through 1758. For the next 29 years of his life Caesar Rodney was never without some public appointment, office or trust. From high sheriff, Rodney proceeded to the offices of Register of Wills, Deputy Recorder of Deeds, and Recorder of Deeds in Kent County. He also served from time to time, as clerk of the Orphans Court, clerk of the peace and justice of the peace.
" Caesar Rodney Statue "
Caesar Rodney began his military career in 1756 during the outbreak of the French and Indian War. He joined Colonel John Vining's regiment, and was named Captain of the Dover Hundred Company. His company, however, was never called into battle. 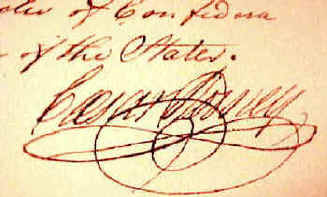 In 1759 he became the Superintendent of the printing of Delaware currency. Then in 1762 he became a member of the Delaware State Assembly and served in that body through 1769 when he became the Superintendent of the loan office. In 1765 he was elected to the Stamp Act Congress along with "Thomas McKean", and later as a Delaware delegate of the First and Second Continental Congresses also with "McKean" and "George Read". In 1766, he was named to the Supreme Court of the colony , even though he also became a member of the Delaware Assembly during the same year. He served in the Delaware Assembly until 1776, and for many years he served as the speaker of that body. In 1769, as speaker, he tried unsuccessfully to have a law passed "prohibiting the importation of slaves" into Delaware. As a member of First and Second continental congress he listened intently to the debates on independence without committing himself, but he was finally convinced that Britain "was making every kind of exertion in her favor to reduce us to unconditional submission … that no hope of reconciliation on constitutional principles could possibly remain". In May of 1775, he was appointed a colonel and in September he became brigadier general of the Delaware militia. He was also the speaker of the Delaware Assembly when on June 15, 1776 the Delaware Assembly, "with Rodney in the chair and McKean on the floor", voted to sever all ties with the Crown. Delaware had officially declared its independence from the British Crown. Later in the same year he became de facto Chief Executive of Delaware, basically making him the 1st President (Governor) of Delaware. However, the title was not official at this time. When the news of Lexington arrived Caesar and his friend from Milford, John Haslet, divided up the Kent County Militia leadership. Caesar later wrote "Now one was either Tory or Whig; it was either dependence or independence". that made him the Hero of Delaware! The Continental Congress was meeting during the spring and summer of 1776 to contemplate declaring its independence from the British Crown. The Delaware delegates included "Thomas McKean" of New Castle, "George Read", also of New Castle, and Caesar Rodney of Kent. "Thomas McKean" and Rodney were in favor of independence and "George Read" felt that it was too drastic of a move at this time. Rodney was busy with his many offices during June of 1776. He was after all a Brigadier General of Delaware's militia, speaker of the state assembly which had also declared him as their leader. He was alternately in his seat in congress, and at work in Delaware, stimulating the patriots and repressing the royalists. When the question of independence was raised he was delayed in getting to congress owing to the fact that, after presiding in June over the session of the assembly that had authorized support of the inter-colonial movement for independence and which virtually declared Delaware independent of the Crown, he had gone to Sussex County to look into a threatened Loyalist uprising. Rodney received a message from "Thomas McKean" letting him know that on July 2 the congress was going to vote on its independence from the British. Knowing that "George Read" was opposed to the idea "Thomas McKean" asked Rodney to dash up to Philadelphia to settle the issue for Delaware. It was an agonizing 80 mile ride through the summer's heat, an angry thunderstorm and torrential rain, over dirt roads choked with mud, across rickety bridges spanning swollen streams, over slippery cobblestone streets of the towns. There wasn't an hour to waste. A lone rider, suffering from a serious facial cancer and afflicted with asthma was headed for Philadelphia. All that he had worked for, hung in delicate balance: the nations independence. As he pushed northward, he must have realized he was rushing to vote for a document that well might put a noose around his neck. On he rode, through Duck Creek (Now Smyrna), Blackbird, Cantwell's Bridge (Now Odessa), past the McDonough mansion, St. Georges, Red Lion, Tybout's Corner to New Castle. On through Wilmington, Marcus Hook and Upland......finally reaching Philadelphia. "As I believe the voice of my constituents and of all sensible and honest men is in favor of independence, my own judgement concurs with them. I vote for independence." Caesar Rodney at age forty-eight was one of only three bachelors to sign the Declaration of Independence. As if his historic ride along with all his public offices weren't enough, Rodney was named a brigadier General in the Delaware militia during the Revolutionary War and was also serving at the same time as the judge of the state's admiralty court. "The readiness with which you took to the field at the period most critical to our affairs, the industry you used in bringing out the militia of the Delaware State and the alertness observed by you in forwarding on the troops from Trenton, reflect the highest honor on your character and place your attachment to the cause in a most distinguished point of view." After returning from his duties in Trenton he was named Major General of the Delaware Militia by acting President of Delaware, "Thomas McKean". Rodney continued in this office until March 31, 1778 when he was elected as the 4th "President" (Governor) of Delaware, an office he served until November 6, 1781. It was noted that Rodney, as governor, brought a stability to the government that the state had yet to experience. Rodney was again elected to the Continental Congress in 1782 and 1783 but he was unable to serve due to his poor health. By now Rodney had become weary in the service of his state and nation. Only in his mid-50's Rodney never the less was exhausted. All that he had done would wear down even a strong man. Imagine what it did to a man suffering for 15 years from asthma and serious facial cancer. The cancer had seriously sapped away his vitality. He referred to his cancer as "that horrid and most obstinate disorder." He later wrote, "The doctor must conquer the cancer, or the cancer will conquer me .... my constitution requires rest and my wish is to indulge it". Never the less, the Delaware General Assembly in the fall of 1783, elected Rodney as the speaker of the upper house, becoming in effect what we call today the Lieutenant Governor of the State. Rodney served as best he could. But by the early spring of 1784, he had become too weak to travel. The upper assembly voted to hold all future meetings at Rodney's home which they did for the next few weeks until April 8, 1784. On June 26, 1784 at 7:00 p.m., only three months later, Caesar Rodney died at his home. The exact date of his death is unknown, however he was buried on his farm on June 28, 1784 which put his date of death close to the 26th. His grave went unmarked for over 100 years. In 1885, then Chief Justice "Joseph P. Comegys" placed a small slab over what was believed to be his grave. 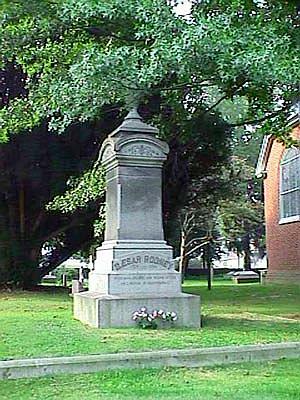 Then, finally, in 1889 the remains of Caesar Rodney were moved to Christ's Church in Dover and a suitable monument erected. Many have noted that possibly the remains moved weren't those of Caesar but of a relative. But it is sure that his spirit lives in his most beloved Delaware. 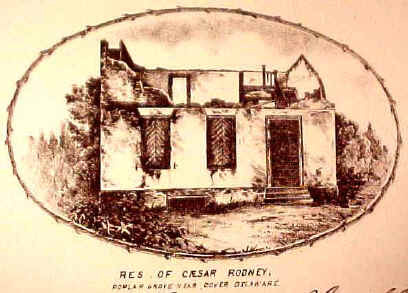 Caesar Rodney's home in ruins!
" Caesar Rodney's Monument "